This dog and kitty marketplace wheels and deals all the things our furry companions need. 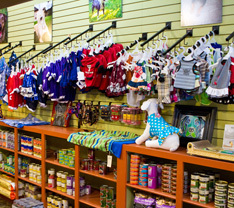 Greeting cards, fancy feeding dishes, toys, healthy snacks, carrying cases (for the Elle Woods types), and holistic cat and dog foods are specialties here. We love that dogs are welcome into the shop anytime. Update: Closing at the end of January 2013.